No matter where you’re standing when you view Half Dome, it’s a powerful moment. Yosemite’s iconic granite mountain is unlike anything else on earth, and its towering location above Yosemite Valley makes it even more awe-inspiring. 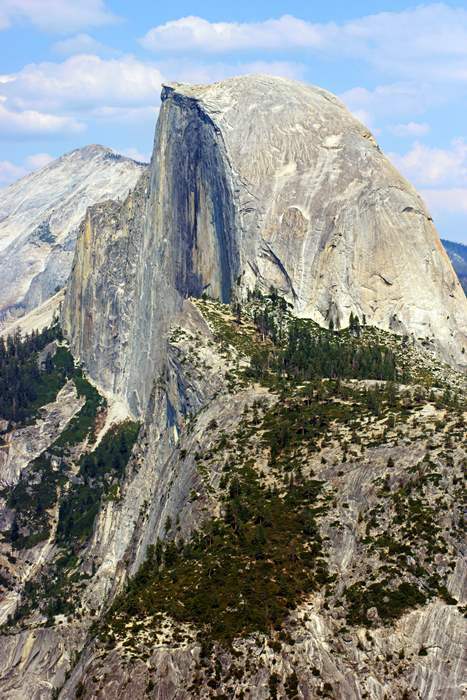 That’s why it’s so important that you don’t pass up the chance to see Half Dome from Glacier Point – arguably the most beautiful viewpoint in the entire park. 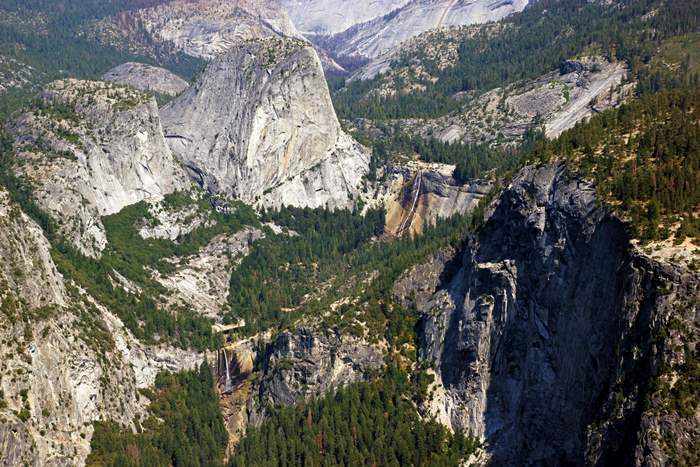 Glacier Point is located directly above the developed portion of Yosemite Valley. 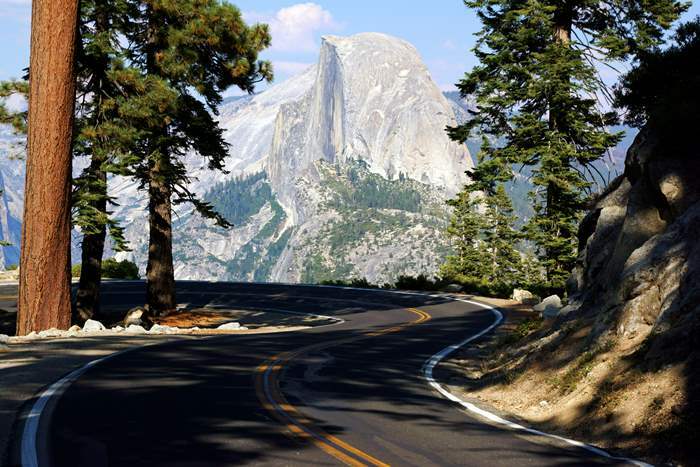 To get there, you have to drive out of the valley via Wawona Road, past Tunnel View (another very good viewpoint), and up to Glacier Point Road. Drive past Badger Pass ski area and continue to the end of the road. Keep in mind that Glacier Point Road is closed during the winter (beyond Badger Pass). It usually opens for the summer sometime in May, but it can open as early as late March, or remain closed until July, depending on winter’s severity. When snow-covered, the road is open to cross-country skiers. You can rent skis at Badger Pass. Most of the drive out to Glacier Point is pretty uneventful, possibly even downright boring. Wawona Road offers some good views, but once you turn onto Glacier Point Road, you have several miles of trees, curves, and traffic, and no real reason to stop and take a picture. And then, suddenly, you arrive at Washburn Point. 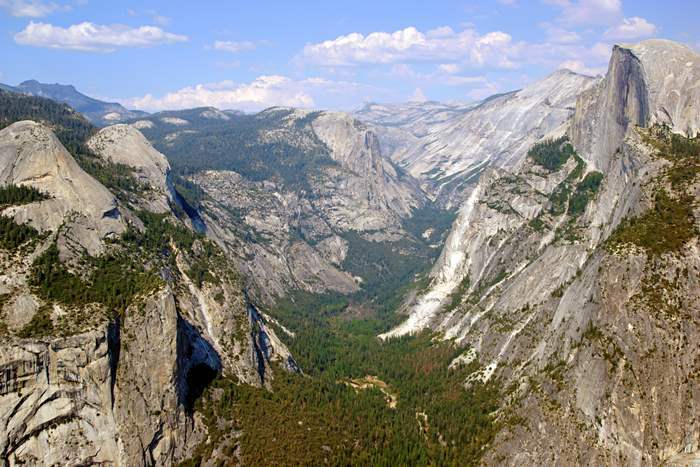 … but you do have a nice perspective on Little Yosemite Valley. Look closely and you can see Vernal Fall (the lower of the two) and Nevada Fall. … and on one of those curves, you’ll see a scene that could inspire anyone to road-trip. The ribbon of pavement sweeps past the edge of the cliff, with an unparalleled view of Half Dome providing the ultimate driving distraction. If you manage to stay on the road, there are just a few more curves before you reach the giant (but crowded) parking area at Glacier Point. And then, there it is: the perfect view of Half Dome. A short trail takes you all the way out to the actual point, where you’ll have a first-class view of everything in Yosemite Valley. Take a look straight down to get your bearings. Below, you can see the roads, hotels, and campsites on the valley floor. Take a look through this monocular to look for any hikers on the top of the dome. 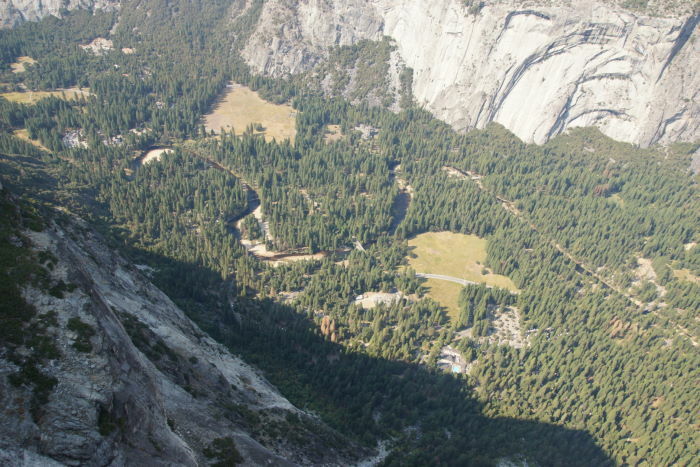 The exhausting summer-only hike requires hikers pull themselves up the side of the dome, using cables. That’s about all there is to see here. You can look at the view from one spot or another, but it’s all great. 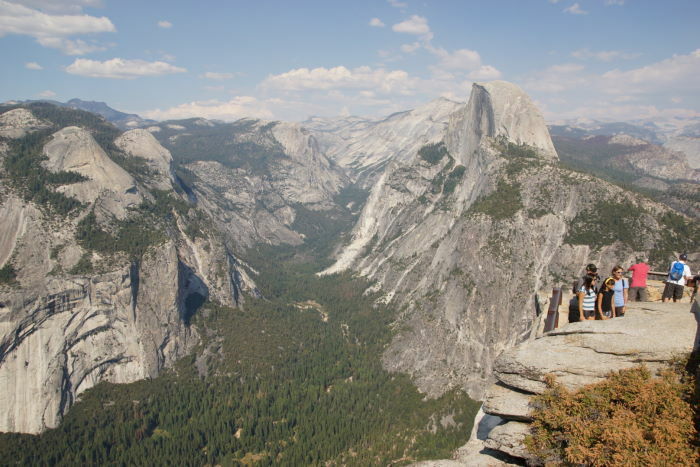 If you’d like to add to your Glacier Point experience, consider the hike out to Sentinel Dome and/or Taft Point. Both provide good views of the valley. 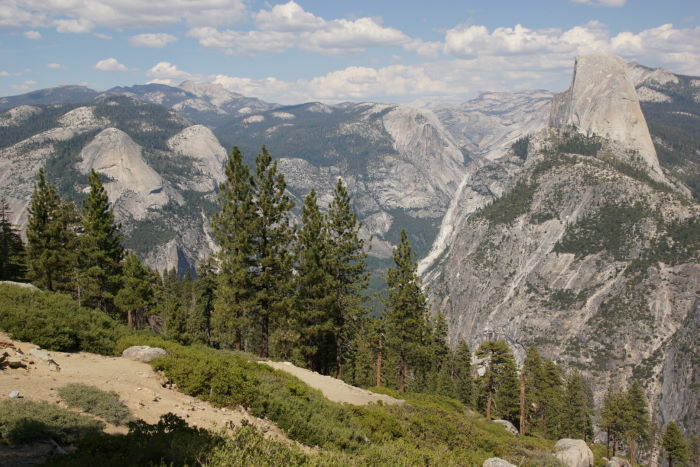 You’ll find a trailhead at the side of Glacier Point Road, shortly before Washburn Point. A loop hike to both Sentinel and Taft is 2.2 miles. 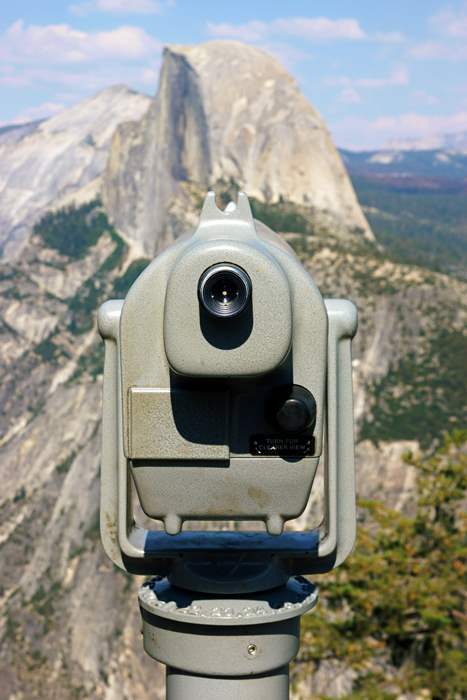 It’s somewhat out-of-the-way, but a drive up to Glacier Point is essential to any Yosemite visit. Try to find time to make the drive, and allow some extra time to simply sit and behold the majestic view.